Click here to see the HP Prime price on Amazon. 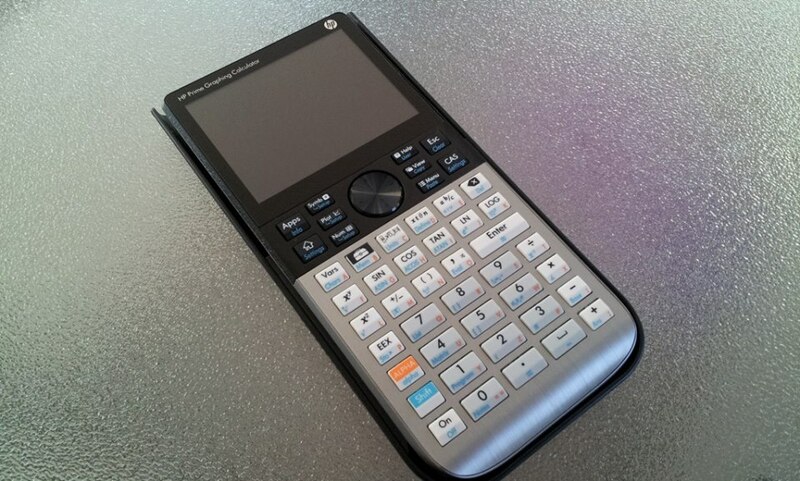 Several years ago, when HP released their latest calculator, the HP Prime, I posted a review here at Tech Powered Math. I wrote in that review that I liked the Prime and how HP was pushing the envelope with a new design and new features never before seen with their new calculator, but I was also left wanting more. In the years since, HP has done a number of significant operating system upgrades to the HP Prime, and I felt the need to update the review. I don’t know if HP read my mind, or if there were just a lot of other fans asking for the same improvements, but some of the things I was asking for then are now some of my favorite things about the Prime. As I said last time I wrote an HP Prime review, in my experience trolling message boards, HP has a very loyal fan base (perhaps rabid, and I mean that in the very best sense of the word) for their calculators, possibly the most loyal fans among the “big 3” calculator makers of HP, Casio, and TI. HP fans are very knowledgeable consumers and a highly technical crew. I’m probably overgeneralizing, but it seems like a large percentage of them are engineers, financial types, and others who possess a very strong understanding of mathematics. And the majority of them love, love, love HP’s implementation of RPN (Reverse Polish Notation). As a long time high school educator, I come at graphing calculators from a slightly different angle. I am obviously interested in a using a graphing calculator that will provide power for the future engineers and wizards of Wall Street. After all, I taught numerous honors classes and AP classes, and I always loved coaching my school’s math team. But as important to me as reaching those top students was, I also look for a device that will connect well with the larger masses of students whose future plans involve substantially less mathematics. When HP let me know they were going to provide me a review unit so I could do an HP Prime review, I knew that’s the direction I wanted to come at it. Would this new touch screen calculator have an accessible user interface for all students while providing the kinds of features that I know I’d want to have available to teach with in my classroom? While it’s true that the HP Prime is a high end unit that has appeal to that traditional HP audience of professionals, I think more than past HP calculators they have gone out of their way to make this calculator appealing to the education market. Before I dive into the details of what I liked about the HP Prime, let me just point out a few of the features that HP has included on the Prime that are clearly targeted at teachers and students. 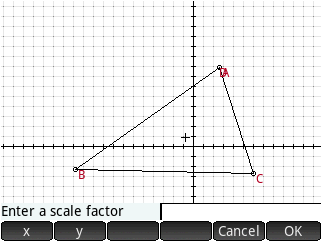 Numerous included educational apps such as dynamic geometry, quadratic and trigonometric equation solvers, a triangle solver, and many others. I experimented with the app system quite a bit and found it to be very intuitive to use as a teaching and learning tool. The touch screen interface definitely enhanced it. An optional add-on wireless system for distributing quizzes and polls, performing screen captures, putting student calculators into exam mode, and so student calculators can be used on the class Smart Board. DataStreamer, an app which allows the HP Prime to interact with over 50 Fourier sensors for data collection. Pursuing features like the wireless system and DataStreamer is important to give the HP Prime credibility in the education market. These are the kinds of features that HP needed to offer to make the Prime a real alternative to the TI-Nspire, since Texas Instruments has been great about making these kinds of important “extras” available to educators in recent years. There is so much to say here. First, there is the hardware itself. The HP Prime is a thin, sturdy device. It features a brushed metal plate covering the bottom half of the front of the calculator, while the top half is black. It’s a striking design; even the cover that protects the Prime looks great. The Prime uses a rechargeable battery which charges via a micro-usb cable. I found that I needed to recharge it at about one week intervals, with moderate use. Soft buttons often appear near the bottom of the display. Minor changes to the viewing window are easy to make using the touch interface. Of course, the number one question most people will have is about the touch interface. Obviously, this is one of the main selling points for this device, what sets it apart from the current Texas Instruments and Casio models. I loved it. I found that there was a little bit of a learning curve that went along with it at first because I had to get comfortable with when to use the touch screen and when to use physical buttons. The Prime often displays a row of “soft buttons” along the bottom of the screen to access features relevant to whatever application you are working with. I am so used to the TI-84 Plus that I found myself thinking I needed to press the hard button just below those soft buttons, like the 84’s F1-F5 keys. Once I stopped being so dense and started using the Prime’s interface the way it was designed, though, it worked splendidly. It’s often the little things that the touch interface makes easier. The soft buttons that I already mentioned are great. The touch screen makes using drop down menus so much easier than a keypad when you are changing settings. Navigating cells on a spreadsheet is faster. I also really liked being able to quickly make subtle adjustments to the viewing window by dragging it horizontally or vertically to see more of a function that would otherwise be off screen. The Prime can graph equations that are difficult to impossible on many other graphing calculators. Speaking of graphing, the HP Prime excels at it. The Prime is capable of graphing just about any type of equation written in terms of x and y you can dream up without the need for any special templates. 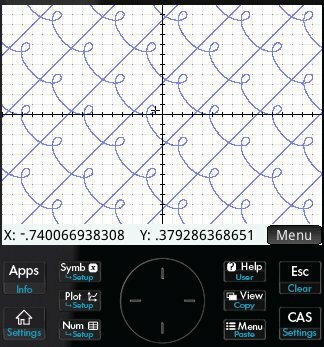 Many other handheld calculators require workarounds to handle vertical lines, circles, conic sections, and equations written in terms of y. The Prime handles these and far more complicated equations with ease. The Prime is a CAS (Computer Algebra System) calculator, meaning it can perform operations on variables, not just numbers. In other words, it knows that x+x is 2x. Of course, this is just the beginning as it can factor, solve equations, find integrals, and do much more with its CAS features. 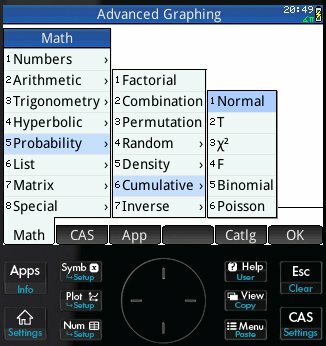 The Prime OS handles the CAS a little differently from most calculators, though. Pressing the home button takes you to a calculator interface that doesn’t have access to the CAS features. Pressing the CAS button takes you to a nearly identical looking calculator interface that does have those features. In addition to CAS features, when in the CAS interface, by default, the Prime returns exact values for fractions and radicals, something that it doesn’t do from the home screen, where those values are returned as decimals. You can hop back and forth between the two interfaces at any time, and there’s even a feature that let’s you quickly grab values from one to paste into the other. It’s kind of like having a TI-Nspire CX and a TI-Nspire CX CAS in the same calculator. Like most other modern calculators, by default the HP Prime does use “pretty print,” meaning fractions look like fractions, exponents look like exponents, and so on. I’ve found this really helps students since they spend less time learning to use the calculator interface and more time learning math. The menu system and drop down windows can be navigated with the keypad or touchscreen, which make navigating them quite a bit easier. The HP Prime also makes good use of drop down and pop up menu interfaces. This is another thing that my students have come to expect after years of practice with computer interfaces. As I alluded to earlier, it does help to be able to navigate the menus by either the touch screen or by the keypad. The HP Prime has lots of nice little touches. In the spreadsheet app, you can automatically resize column width by double tapping the column border. You can also change the background color of cells. I really like how the Prime handles matrices larger than 2×2. A 2×2 matrix is loaded with blanks for each entry, but with a “plus or minus” entry at the end of each row or column. Just pressing the + or – sign in one of those entries will add a row or column. These types of small bonuses left me continually exploring the HP Prime’s user interface for more great little features. 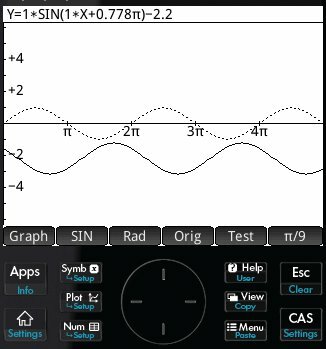 Multi-touch worked great with the trig explorer app. Pinch to zoom was a significant upgrade. HP has rolled out many firmware updates for the HP Prime since its initial release. This is exactly what users and potential buyers should want to see as it is a sign that they are taking continuing support of the platform seriously. The lack of pinch to zoom was something I complained about in my initial HP Prime review. The team at HP has implemented it, and wow, did they get it right! I’ve seen graphing calculators handle zoom a number of different ways from auto zoom to box zoom to specifying the corners of the viewing window manually, but nothing beats the HP Prime’s pinch to zoom. Simply take your finger and thumb and pinch in and out the way you would on any smart phone. It’s intuitive, it’s fast, and it’s graphically impressive how well it renders. The touch screen makes it easier to explore geometric relations. The geometry app has seen improvements since the original release as well, another one of my asks in my original review, making it easier to select and interact with geometric figures. Touch really enhances the ability to do explore with geometry as you explore with shapes, doing constructions, and transformations such as dilations, rotations, and reflections. The HP Prime is excellent hardware that breaks new ground. A few years back, Casio showed us what color a full color display could mean for a graphing calculator with the Casio Prizm. Now, the HP Prime blazes new trails with a multi-touch screen, and while I wouldn’t describe it as quite as easy to use as recent models from TI or Casio, it’s still revolutionary, and the most impressive calculator I’ve ever seen from HP. If you are a tech savvy learner and you find a feature you want isn’t officially supported, say 3D graphing, you may be able to find unofficial support for that feature in the previously mentioned thriving HP Prime community. Navigating with the touch screen does remind one of navigating with a smartphone OS. I was excited to learn that the College board (eventually) did the right thing and approved the HP Prime for use on their SAT exam because there is no way I can be convinced that its touch screen offers any inherent advantage over other calculators like the TI-Nspire CAS or TI-89 Titanium. It’s the right thing to do because HP has created a great device for students, one that potentially raises the level of expectations for their competitors.